Clients anywhere from the country can make a great deal from us for Shock Absorbing Caster. We manufacture and fabricate these casters to provide them the best of shock absorbing ability and to withstand heavy load. These are mainly installed on gate mounts for better flexibly. In addition, they have reduced noise levels and extended bearing life. 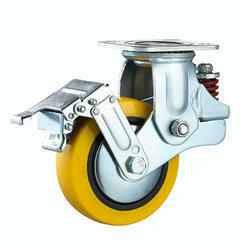 We bring to our clients Shock Absorbing Caster available with modern suspension system. It reduces damage to delicate products while handling and mobilizing. Avail these at competitive prices. Looking for Shock Absorbing Caster ?